Last Farmers Market of the Summer – Today! This Thursday, August 25, is the last day of the summer season for the Fredericksburg Farmers Market. Stop by Kinderhalle at the Fredericksburg Marktplatz from 4:00 – 7:00 p.m. to pick up fresh produce, enjoy live music, and more. Plans are in the works for the Fredericksburg Farmers Market to return the first Thursday in October – watch for more updates. 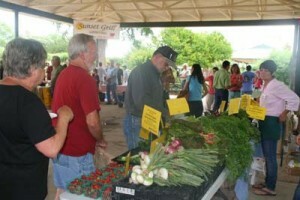 The fall location will be on the grounds of the Pioneer Museum at 325 W. Main St. For more information about the Fredericksburg Farmers Market, log on to www.fbgfarmersmarket.com. /wp-content/uploads/logo-new4.png 0 0 Jeff /wp-content/uploads/logo-new4.png Jeff2011-08-25 09:17:472015-04-21 17:35:29Last Farmers Market of the Summer - Today!